I'm gonna share what I made for my friends. Soo, few weeks ago, I'm joining Pay It Forward. It's like you giving something to 5 persons, and for the return those persons also do the same. It could be handmade cards, or anything. I'm sooo in love with Magnolias lately! I'm such a moody girl, sometimes I love A and in a blink of eye I love B. And if I love something, I keep using them, LOL. I made two types card, with pink and red colours. And also don't forget to visit our store for seeing what's new (of course that's tons! LOL). 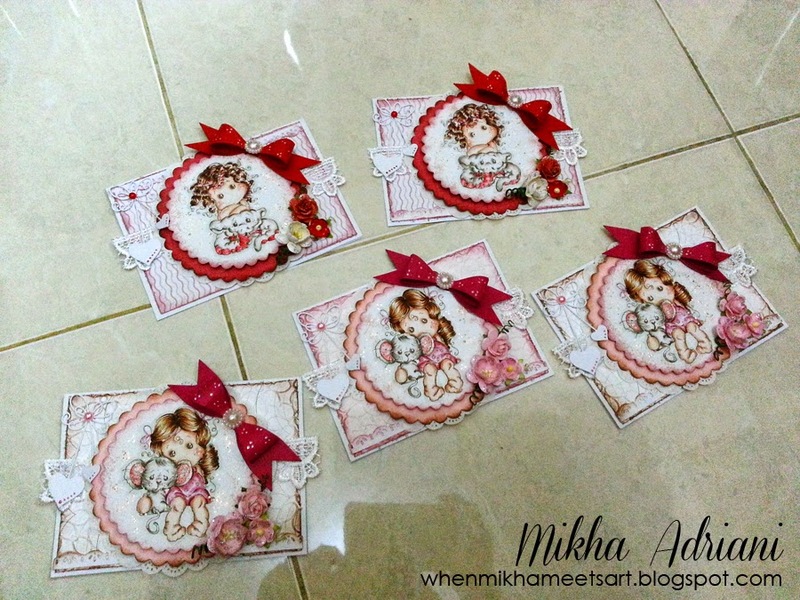 Super cute cards Mikha! Your colors are beautiful! These are SO sweet! And I love the idea of paying it forward! I'm sure your friends will be thrilled with these! Awe ... GREAT job Mikha and what a fabulous idea!